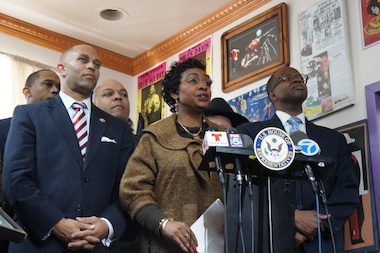 Congresswoman Yvette Clark, Congressman Hakeem Jeffries, and Brooklyn DA-elect Ken Thompson joined other elected officials and community leaders in calling for an end to alleged "knockout game" attacks in Brooklyn. CROWN HEIGHTS — Police have arrested four children in connection with a string of alleged "knockout game" attacks in Brooklyn, the NYPD said. A 14-year-old girl and three other children, aged 10 and 11, were arrested in connection with three assaults that took place between October and November. The victims included an 11-year-old boy who was punched on President Street, a youth who was hit with a rock while walking home from school and a youngster who was "mushed" in the face with a plastic bag, said Deputy Inspector George Fitzgibbon, the 71st Precinct's new commanding officer. "Kids are kids — when you’re talking 10 and 11 year olds getting involved in these type of things, sometimes they don’t realize the magnitude of what they’re doing," Fitzgibbon said. While the NYPD's Hate Crimes Task Force worked on the investigation as well, police determined that the attacks were not motivated by bias. "Every time one of these incidents did occur, nothing was ever said with regard to any kind of bias, so to speak," Fitzgibbon said of the three attacks, which occurred in October and November. "The only commonality is that basically all the victims were Jewish." Police made the arrests after zeroing in on the neighborhood's middle-schoolers, who were both the victims and the suspects of several of the attacks. "The knockouts that we were experiencing seemed a lot towards youngsters," Fitzgibbon said. "My school team did a lot of work uncovering information, and the Hate Crimes team did a lot of good work following up on that information. "When people saw we were able to actually solve one of these incidents, word gets around to the local schools and to the kids that might be involved or haven’t been caught." It was not immediately clear if the three incidents were part of the so-called "knockout game," in which teens sucker-punch strangers in an attempt to knock them out, then flee without taking anything from them. The youths were arrested between Nov. 13 and Nov. 23 and were charged with assault, endangerment and criminal mischief, Fitzgibbon said. The names of the youths who were arrested were withheld by police because of their ages. The 14-year-old girl is being processed through the Family Court system, but updates on her case and the cases against the other three children was not immediately available. Police are still investigating several other potential knockout incidents involving older victims.